We live in a hobby littered with questionable photography. That shot is just one of so many to choose from (or avoid). 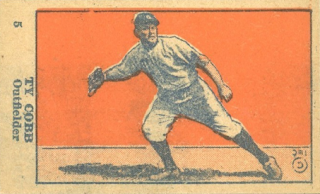 But at least guys like Ty Cobb don't have to worry about disrespect to their playing poses. Usually? 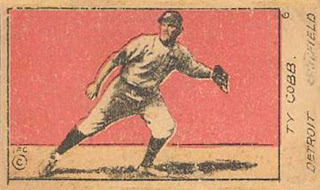 This 1921 W516 strip card commits three errors on one play. 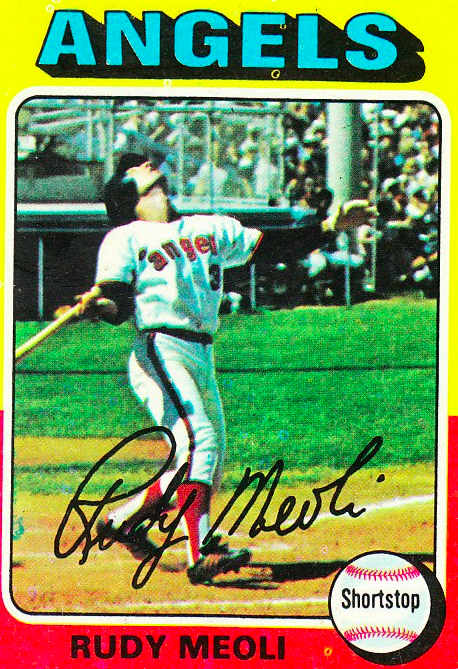 It shows Cobb backwards (glove on wrong hand, logo on wrong side of jersey), fielding instead of batting or running (his normal card M.O. ), and missing 50% of his noggin from bad machine cutting or clumsy scissor work. What makes this botched image notable is that it's the first W516-2-2 #5 I've seen, one of several variations on a single strip card theme. 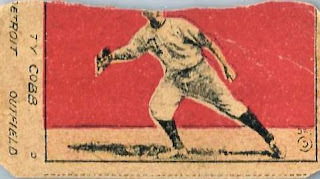 Another apparent W516-2-2 from eBay nearly drops the "DETROIT OUTFIELD" tag line entirely. 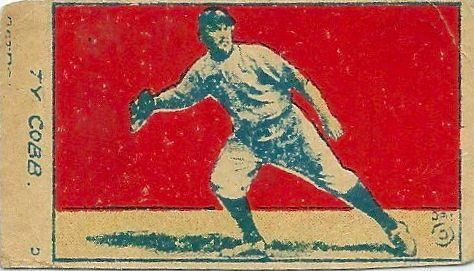 1920s printers were nowhere near as organized as those today, so production differences prove common (and frustrating) for modern collectors. For example, W516-2-1 (profiled in 2009 and shown below) used the same image with a typeset name. Note that IFC (C) sign at lower-right's backwards on both cards. There's also this W516-2-3 version with typeset name and corrected IFC (C). W516-2-3 also "fixed" his flipped photo, as seen on W516-1-* Cobbs. W516-2-* checklists share the same 30 players with W516-1-*, but use different numbers. 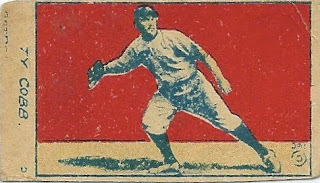 My profile of W516-1-1 #5 Tris Speaker goes into more depth on the set's origins. Many card references disagree on the W516-*-* classifications, but experts at Net54 discussed them in detail. 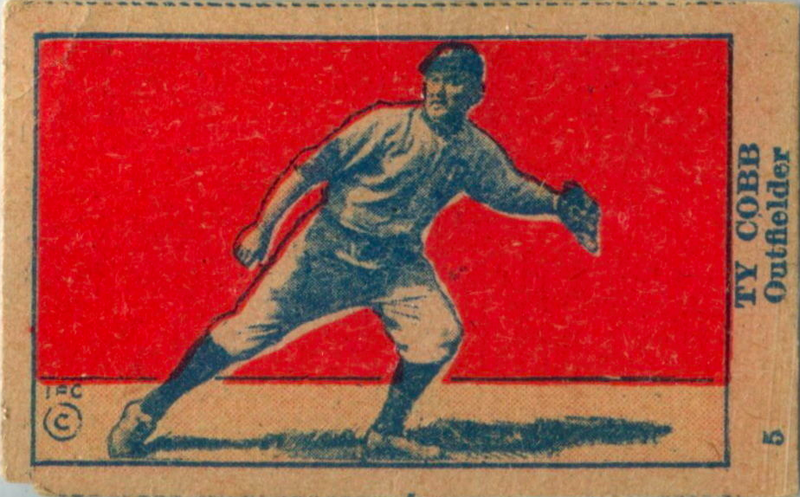 Value: An eBay seller listed this abused #5 for $50, more than I've paid for other VG/EX W516 Cobbs in the past. It's possible the market's ready to shell out more for these humble strip cards, but more likely that eBay encourages people to charge too much. 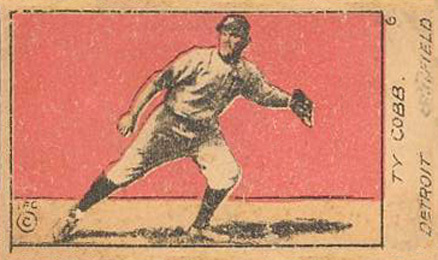 Fakes / reprints: Ty Cobb's always vulnerable to counterfeiting, so buy from dealers you trust and know the provenance of their stock.